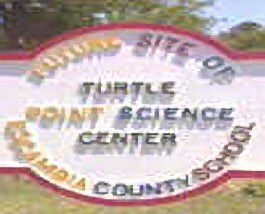 The Turtle Point Research Center, located on Highway 31, adjacent to the Flomaton Hurricane Park, is a learning center for Alabama Students as well as the general public. The Center deals with local populations of aquatic and forest life as well as environmental issues. The main building houses a laboratory and classroom, with a shaded boardwalk leading to a scenic area overlooking Big Escambia Creek.